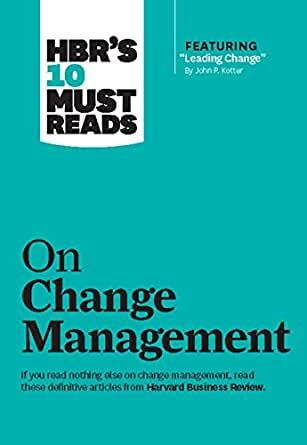 If you read nothing else on change management, read these 10 articles (featuring “Leading Change,” by John P. Kotter). We've combed through hundreds of Harvard Business Review articles and selected the most important ones to help you spearhead change in your organization. This collection of best-selling articles includes: featured article "Leading Change: Why Transformation Efforts Fail" by John P. Kotter, "Change Through Persuasion," "Leading Change When Business Is Good: An Interview with Samuel J. Palmisano," "Radical Change, the Quiet Way," "Tipping Point Leadership," "A Survival Guide for Leaders," "The Real Reason People Won't Change," "Cracking the Code of Change," "The Hard Side of Change Management," and "Why Change Programs Don't Produce Change." Most articles fall into what could be called the "Scientific Management" or Tayloristic approach to change management. With a few exceptions, written for a more oppressive industrial era. Has little to offer for the knowledge economy where change and innovation need to be conceived as group process, not top-down coercion. 5.0 out of 5 starsThis is the change management bible. This book was recommended to me by a friend who has had a successful career as a change management consultant, after working for IBM for years. There is an almost identical book which has a Chinese painting on the cover and contains 8 of the 10 articles in this book. Make sure you don't order both! This is a great read for anybody interested in formulating a structured approach to implementing change. 3.0 out of 5 starsNot bad but not brilliant. Like a lot of Harvard Business Review material, much is well-written but obvious.